The Community Clinic of Southwest Missouri is bustling with activity on a Thursday evening. 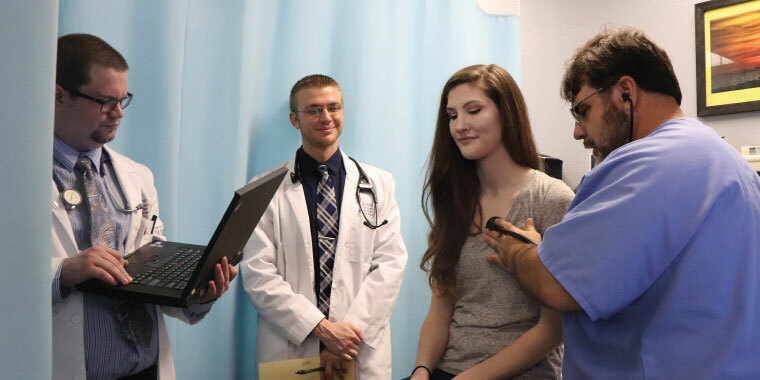 Pairs of Kansas City University of Medicine and Biosciences Joplin Campus medical students file into patient rooms, clipboards in hand, to take turns triaging patients, taking medical histories and performing physical exams. For these students, this is their first interaction with a real patient. 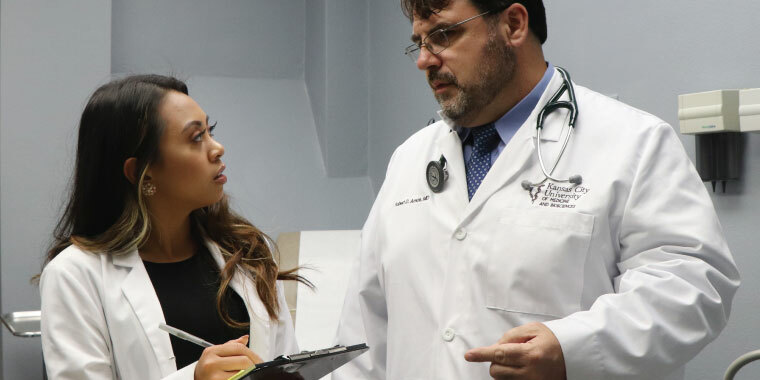 Up to this point, they have practiced their examination skills with standardized patients, actors playing the role of a person with a medical condition. KCU-Joplin faculty members Robert Arnce, DO, KCU assistant professor of clinical medicine, with KCU medical student Rieffe Dia. Meanwhile, KCU-Joplin faculty members Robert Arnce, DO, KCU assistant professor of clinical medicine, and Ken Stewart, DO, KCU assistant professor of emergency medicine, wait for each pair of students to emerge from a patient’s room; then carefully listen as each medical student presents his or her findings. Then, one of the faculty members examines the patient as the medical students observe. Throughout the evening, the students also work alongside Community Clinic of Southwest Missouri nurses, social workers, pharmacy staff and a registered medical assistant, which helps the students learn the critical function of a health care team. KCU-Joplin has partnered with the Community Clinic of Southwest Missouri to create this innovative program with a twofold purpose. The Thursday evening clinics provide valuable early clinical experience for second-year medical students and at the same time expand access to health care for community members who need it most—those who are uninsured. The Community Clinic is not new. The clinic has served the Joplin community and surrounding area for more than 25 years, completing more than 140,000 patient visits during that time span. However, this unique partnership with KCU allows the Community Clinic to be open on most Thursday evenings to serve patients, in addition to current daytime hours. “This partnership expands our ability to serve more people. Patients who typically couldn’t come in during the day can now come in and get care,” said Stephanie Brady, executive director of Community Clinic of Southwest Missouri. “What makes this program unique is that the Community Clinic is woven into the fabric of the community. KCU is helping to augment this resource that the community depends on,” said Dr. Ronnie Martin, KCU-Joplin interim campus dean. This clinical experience program also helps remind students why they were motivated to pursue a career in the medical field—to serve others. At the Community Clinic, 100 percent of the patients lack health insurance, 80 percent of those patients are part of the working poor, 10 percent are undocumented, and 10 percent are chronically homeless. After the discussion, faculty members teach the students about a common health concern that the students might see in the clinic, such as high blood pressure, urinary tract infections or headaches. “We want to give them a ‘cookbook’ of common health problems and a ‘recipe’ for how to assess and manage common issues,” said Dr. Arnce. For more information about the Community Clinic of Southwest Missouri, visit joplinclinic.org or call 417-624-5500.